Whether you're hoping to cause a stir in the late summer border or planning out a cutting garden for impressive fresh-cut bouquets, you're going to want to plant in multiples. 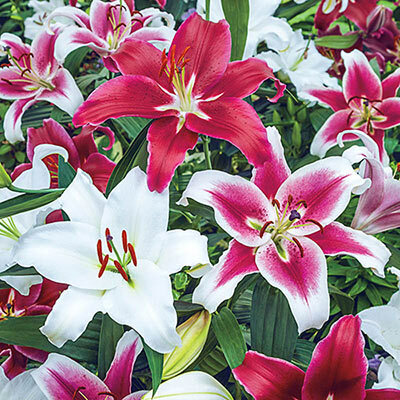 Grow plenty of dramatic, spicy-scented blooms for all your summer plans with this 8-bulb Oriental Lily Mix. The broad, vibrant blooms over lively, plush foliage make your late summer garden feel like paradise. 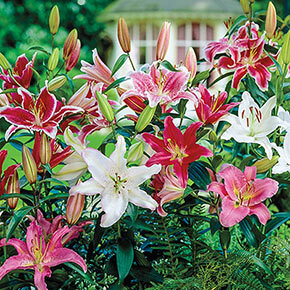 Oriental Lilies aren't only incredibly showy, they're also extremely easy to grow if you have a sunny, well-drained spot. They're strong performers, tough plants and a cinch to perennialize. 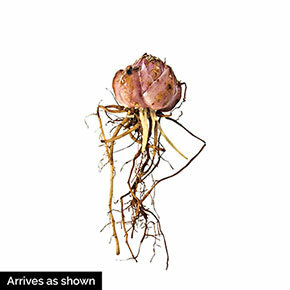 Lilium orientalis For this mix, our team will randomly select eight Oriental Lily bulbs. They will be individually labeled so you exactly which varieties you're growing. Soil Requirement: Loose, well drained soil.